The present-day seismic structure of the mantle under the North Atlantic Ocean indicates that the Iceland hotspot represents the surface expression of a deep mantle plume, which is thought to have erupted in the North Atlantic domain during the Palaeocene. The spatial and temporal evolution of the plume since its eruption is still highly debated, and little is known about its deep mantle history. Here, we use palaeogeographically constrained global mantle flow models to investigate the evolution of deep Earth flow beneath the North Atlantic since the Jurassic. The models show that over the last ∼100 Myr a remarkably stable pattern of convergent flow has prevailed in the lowermost mantle near the tip of the African Large Low-Shear Velocity Province (LLSVP), making it an ideal plume nucleation site. 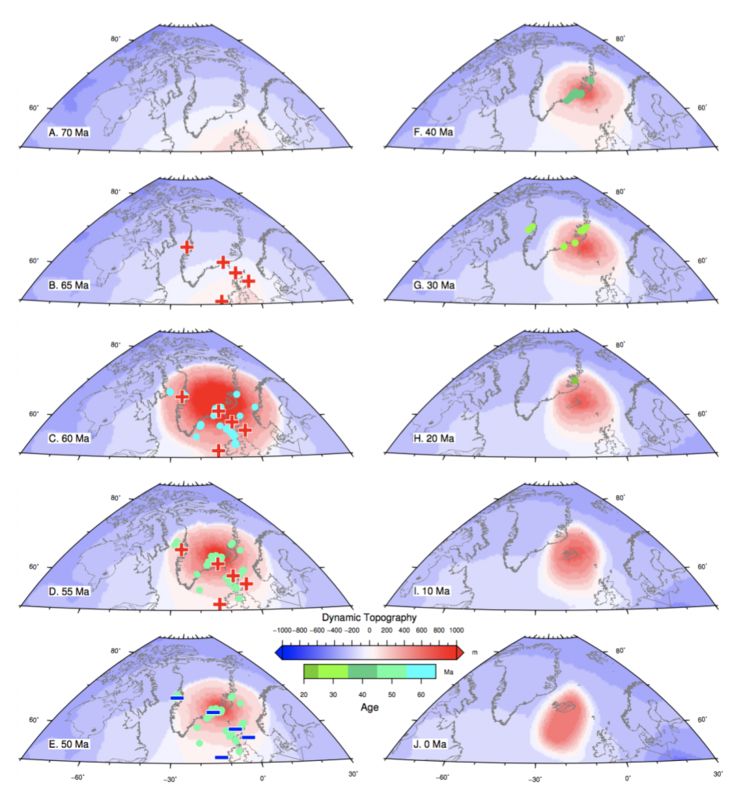 We extract model dynamic topography representative of a plume beneath the North Atlantic region since eruption at ∼60 Ma to present day and compare its evolution to available off- shore geological and geophysical observations across the region. This comparison confirms that a widespread episode of Palaeocene transient uplift followed by early Eocene anomalous subsidence can be explained by the mantle-driven effects of a plume head ∼2500km in diameter, arriving beneath central eastern Greenland during the Palaeocene. The location of the model plume eruption beneath eastern Green- land is compatible with several previous models. The predicted dynamic topography is within a few hundred metres of Palaeocene anomalous subsidence derived from well data. This is to be expected given the current limitations involved in modelling the evolution of Earth’s mantle flow in 3-D, particularly its interactions with the base of a heterogeneous lithosphere as well as short-wavelength advective upper mantle flow, not captured in the presented global models. Citation: Barnett-Moore, N., Hassan, R., Flament, N. and Müller, Dietmar, 2017, The deep Earth origin of the Iceland plume and its effects on regional surface uplift and subsidence, Solid Earth, 8, 235-254.